Ok, I know when you turn 50, you are supposed to do radical things like jump out of an airplane, follow Metallica around as a Roadie or run a Marathon. Well I have none of those on my bucket list. But I told two of my woo woo friends that I wanted to take them on a Soulful adventure. My friend Lem was turned lose to search the internet and find the most meaningful way in which to accomplish this epic trip. He came back with a clear front runner, Sedona, Arizona and a company called Sedona Soul Adventures. After reading the reviews on their website, it seemed like this was the chosen one. So Lem and my other friend Victor signed up for the program. Within a few days we were filling out registration forms asking about our wants, desires, history and beliefs. It was an incredible in-depth survey. Then Mary, our “Guide” called us to go over the surveys. She had a kind and safe voice over the phone, I instantly felt drawn to this person and started getting excited about our adventure. So we made a beeline for Sedona on September 24, we checked into the Enchantment Resort which is hidden in the Redrock Canyons. The next morning we were taken by our guides to a Vortex. They did a ceremony that called upon our guides to be with us during this journey. My traditional Catholic upbringing started telling me maybe I had gone into the deepend of the pool, but what the heck, I told her I was in and up for the journey. That night we hiked up Crystal Cathedral, a beautiful vortex that sits high above the city. John our guide looked the part of a Native American with long, dark hair and dark skin, in reality he turned out to be an Italian from New England who had gotten his degree in metaphysics. 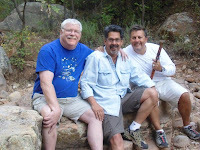 He had come to Sedona on a visit many years ago and decided to make it his home and teach. He was a brilliant young man, who looked 25 but from his stories I pegged him at about 41. We sat under the brilliant stars as he spoke of Indian teachings, the 2012 theory, native American traditions, history of the area. He brought his digerydoo and his Native American flute and entertained us. It was an amazing night, lying there on this flat rock listening to his music and seeing not one, not two but three shooting stars. Over the course of the next three days, I experienced many different practitioners. The intense breathing woman, the energy healer, the native astrologer, the channeler and a soul counselor. I have to say, I experienced some things that I never thought I would. But at the risk of people thinking I am crazy I will save those for my journal. The message here is that we need to all try different things and be open to the possibility of what they may bring you. During this week, everyone told me I must surrender, not easy for a type A CEO, who loves control. But what the heck I did and discovered much about my self. I am thankful for this experience and thankful and Blessed that Lem and Vic experienced it with me. Imagine my surprise finding this post. I've got two things on my mind tonight: my mother who is in the early to mid stage of Alzheimer's, and looking beyond the immediate sadness I feel toward my 50th birthday in June which I will spend in Sedona. I'm considering Soul Adventures also, and would absolutely love to speak with you about it — maybe it would help me decide if I should do it. Any way we could connect by phone or email?